Skimo racers don’t sweat nearly as much as 1980s tennis players. 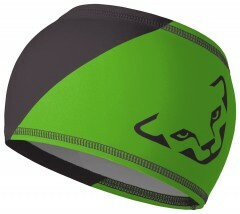 Dynafit consequently designed a band with different characteristics than the old white-cotton sweatbands. The Performance Dry Band has a comfortable brushed lining and wicks away moisture while protecting ears from frostbite. The headband is perfect for days when full head coverage is too much but no protection risks freezer burn on the descent. Made from 80% polyester and 20% elastane (spandex), the light band is stretchy and fits neatly under a helmet. Comes in monster green, dawn red, sparta blue, fiji, or black & white. Each is emblazoned with the Dynafit logo and weighs 15g before you break a sweat. Just a headband, but a very nice headband. Very light / compact (unnoticeable in a pocket), somewhat wind-resistant, perfect for skinning all winter and warm enough to be sufficient for descents in temperatures down to maybe 20F, for my preference anyway... any colder and I usually go for a hat. Also works nice for running/hiking all year round.